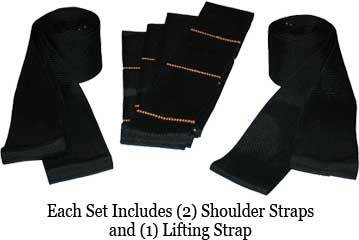 Without a TeamStrap, "up to 80% of North Americans will injure their back." A patent-pending innovation in moving furniture, TeamStrap ® is a two-man adjustable furniture moving strap capable of supporting up to 650 lbs. With the average household sofa sleeper weighing up to 400 lbs or more, carrying one by hand is cumbersome and dangerous. 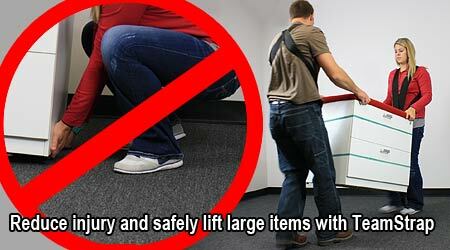 But with TeamStrap furniture moving straps you can carry just about any piece of furniture almost effortlessly. Move everything from beds and sofas to bookshelves. Even heavy appliances like refrigerators and washing machines are a breeze to move with TeamStrap. TeamStrap consists of two harness straps that go around the shoulders and one adjustable moving strap that supports the object being moved. The TeamStrap moving strap makes carrying large, hard-to-handle furniture a piece of cake. Easily move furniture around corners, up and down stairs, and through tight spaces.